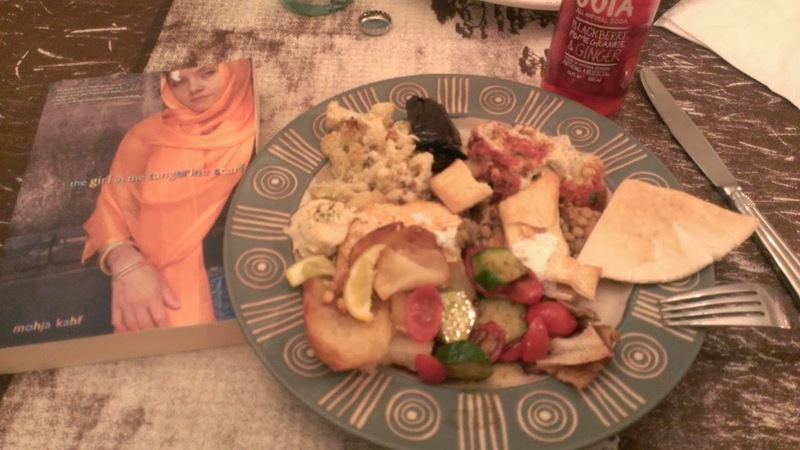 On Thursday we held our Arab Authors Book Club, where we gathering to discuss a book we had all previously picked as a group and read since the last time we met, six weeks ago. I always look forward to this evening on my calendar because of the wonderful conversation and amazing food. Last night was no exception. We meet to discuss The Girl with the Tangerine Scarf by Mohja Kahf. It’s always hard trying to decide where to start. I had read the book when it came out in 2006 and attended a reading by Ms. Kahf at the Elliott Bay Bookstore. I remember loving the book for its familiar similarity to my growing up Muslim in middle America. However, unlike Ms. Kahf, I have never felt the calling to put on a scarf. There are two exceptions: out of respect when I enter a mosque for prayer, or when I wore one to visit the churches and monasteries of Italy on my honeymoon. It was fascinating to hear how the stories of Ms. Kahf were transformed by the different women around the room who interpreted them in unique ways. Our long table was full of women of various ages, some speaking Arabic as our mother tongue, while others had never heard the language because their parents were trying to assimilate at the turn of the century in America. 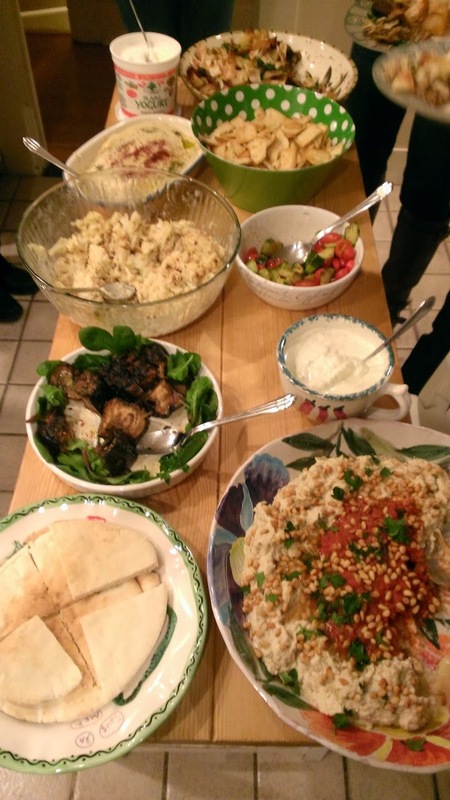 It was also a mix of Iraqi, Lebanese, Palestinian, Libya, Egyptian and American women that had their own stories of immigration and their contact with Islam (we had a mixture of Muslim and Christians equally breaking pita bread together). A small table full of love and spices. Leaving the best for last was our dessert, which included pies from a local bakery, sweets from a professional caterer, and a dish made in celebration of our two newest book club members: Dalia and Jenna. These two beauties were born this past year to our book club members and we welcomed them in the Lebanese tradtion of eating meghli in their honor. As you can see from the photo below, the dessert is made in individual dishes, then bowls of walnuts, crushed almonds, coconuts, and raisins are passed around to place on top. If you would like to think in comparisons of American food, the closest combination is yogurt with granola, but meghli is so much more sweeter and even more yummy than you can imagine. So, if you are expecting, make sure to make some Lebanese friends soon so they can bring you some meghli to celebrate your baby. I’ll have the recipe up tomorrow. Visit A Crafty Arab‘s Amazon shop to see more Arab authors. Or visit A Crafty Arab on Pinterest to see more book selections. When her picture-perfect marriage goes sour, Khadra flees to Syria and learns how to pray again. On returning to America she works in an eastern state — taking care to stay away from Indiana, where the murder of her friend Tayiba’s sister by Klan violence years before still haunts her. But when her job sends her to cover a national Islamic conference in Indianapolis, she’s back on familiar ground: Attending a concert by her brother’s interfaith band The Clash of Civilizations, dodging questions from the “aunties” and “uncles,” and running into the recently divorced Hakim everywhere. Beautifully written and featuring an exuberant cast of characters, The Girl in the Tangerine Scarf charts the spiritual and social landscape of Muslims in middle America, from five daily prayers to the Indy 500 car race. It is a riveting debut from an important new voice.